Price is stuck in a coil, which usually is a continuation pattern. We are on week 6 of a new intermediate cycle or week 35 of existing. Will adopt full swing play when buying opportunity presents itself. Followers of our portfolio will know that we aim to keep the portfolio as diversified as possible by being invested in volatility plays, value plays, and swing plays. One swing play which we have been focusing on recently has been the precious metals sector. Why? Because gold, for example, is well overdue an intermediate cycle low. In fact, it may be already in. The reason why we need to remain alert to this intermediate cycle low opportunity is two-fold. They only come around every 20 to 30 weeks and are the next best buying opportunities (next to yearly cycle lows) in an up-trending market. Many times, rallies out of intermediate lows can be very aggressive. If one is not precise with one's entry, one can very easily miss a large chunk of the initial move. As mentioned, gold could have printed its intermediate cycle low 29 weeks after the previous ICL last August. This is why we took initial positions in this sector. The jury is still out, however, on whether gold's ICL is truly in. Why? Well, for starters, we did not get that aggressive rally out of those March lows (something like convincing higher highs), which would have enabled us clearly to call the birth of a new intermediate cycle in this sector. The great thing, though, about monitoring cycles when seeking our potential swing plays is that cycles always come to an end. Therefore, if this is the same intermediate cycle in play since last August, this would mean we are now on week 35. This, then, begs the question whether we are on week 6 or week 35. Let's go to the charts to see if they can tell us something. 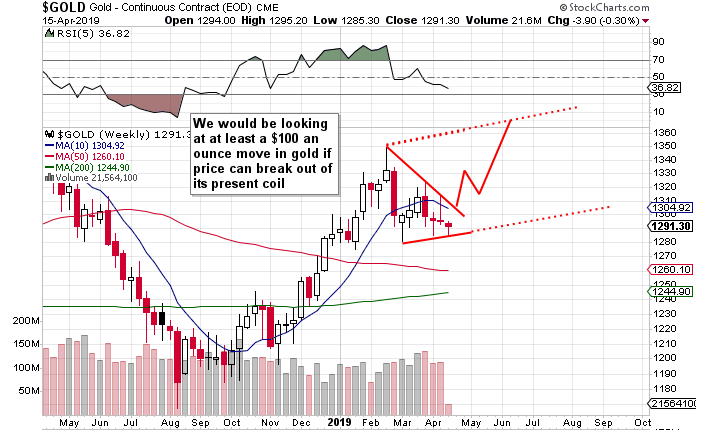 As the chart shows above, gold has been undergoing a coil or symmetrical triangle pattern since it topped out back in February. Now, usually, these patterns are continuation patterns, which, in gold's case, should be a continuation of the previous upward move. From a bullish perspective, we like how the RSI oscillator (off a 5 setting) has remained above "30" on the daily chart. Furthermore, we are going to get an answer here one way or the other very soon, as price approaches that apex. If we go the weekly chart, we can see that the coil is far more visible. If we project a parallel line (to the lower trend-line) from the February highs, we can calculate approximately how much upside there would be to this swing play in gold. 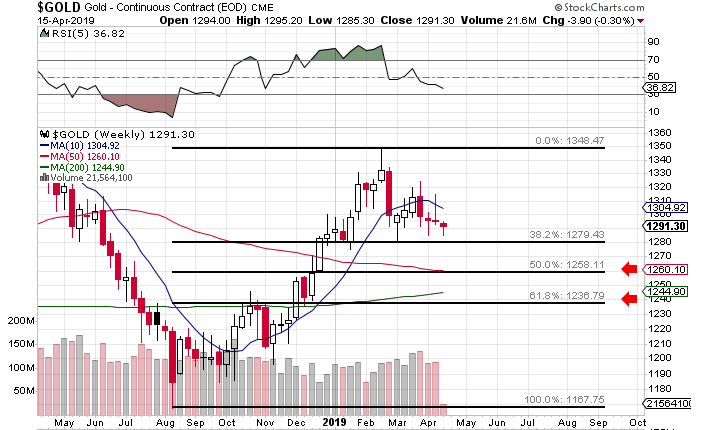 Alternatively, if the lows are not in gold at present, we can use Fibonacci retracements as possible targets for the next intermediate low. As we can see from the chart below, price already retraced to the 38% level back in March (which is why we took initial positions). The 50% level is at around $1,258 an ounce with the 61% at $1,236 an ounce. This is why at present, there is no need to have more long deltas in this swing play. Price continues to drift towards that apex, which means we should have a definite answer on short-term direction any day now. Bulls should be targeting the top of that symmetrical triangle trend-line as entry points. 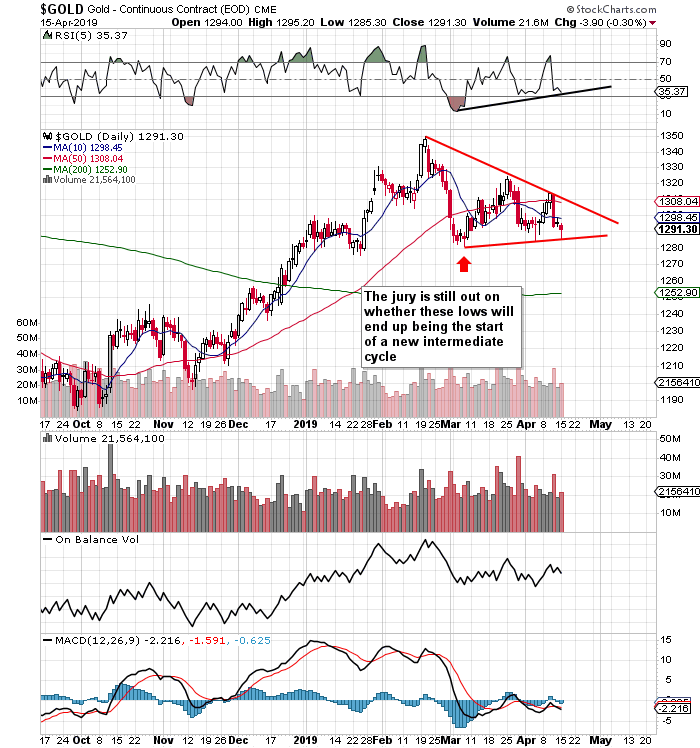 A close above the triangle should occur on strong volume. On the contrary, if we indeed drop to the 52% or even the 62% retracement level, these targets would most likely offer even more attractive entry points. The lower the sentiment can drop to, the more aggressive the snap-back rally should be, as a consequence. In any event, we will monitor events closely. 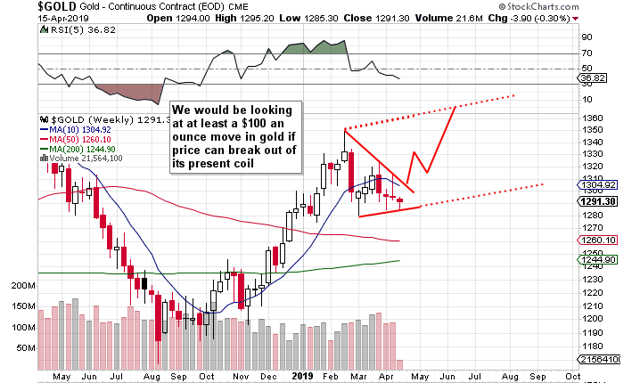 Silver or the mining complex may offer more aggressive vehicles when playing this next pending intermediate up-move in the metals.